This bell jar demonstrates that sound waves can't travel and therefore can't be heard without air or matter. 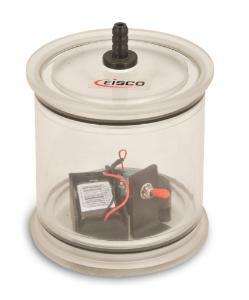 It features a battery-operated buzzer housed inside an acrylic tube. When the buzzer is placed beneath the jar, and a vacuum seal is created in the chamber, students observe a total absence of sound. Once air is returned to the chamber, the sound of the bell can be heard once more.